Like every other aspect of every other renovation, how you do this will be different to the next person. I can only let you know what I experienced. Choosing a builder/carpenter/certifier etc might be done at the start of your project before you even get ideas. It might not be done until you have approval for your plans or somewhere in-between. The trick with this is this: you can get a ballpark figure of what something might cost you when you're throwing ideas around. But until the plans are approved, the engineer's report is done and they specify what materials are required to build your place, no-one can you give you an accurate price guide. And even then, there are always (ALWAYS!) surprises, problems, muck-ups and/or changes which will affect your bottom line. I discovered this when I started shooting off my draft plans to some local builders whose work I admired. They couldn't really give me a quote until I had the engineer's report. But I couldn't get an engineer's report until I had council approval. And what if what I had approval for ended up being a lot more than we estimated? Because engineers throw in things like steel, bracing, expensive materials, extra footings and extra... stuff! And with that extra stuff comes extra labour to put all the extras in. And it all adds up. To a lot. But that part of things aside, how do you find the right person? Well sometimes, it's the one person who actually turns up and gives you a quote. Not even kidding - builders are notorious for just not showing up. I had two not arrive, one gave me an estimate range where the difference was $100,000. Another just said he wouldn't do it until I had all the plans. I thought with such a big build, we should go with a proper top-notch builder and complete team. And they all let me down. So we looked into home building courses and what was required and went back to our carpenter who had done some other works at our house. He was qualified as a builder but didn't enjoy doing it - preferred to actually build than manage. He broke down the build and gave us quotes for each aspect of it as he expected it to be if he had free reign to build. We knew there would be extra things that might come with the engineer, but we at least had a guide as to what wouldn't change (brick footings/roof etc) and what would differ depending on materials we chose (decks, flooring etc). He made suggestions and listened to ours. He was happy for us to go owner/builder and for Steve to labour occasionally when he was able to. We decided to go that route and waited for our approval. Just before council finally stamped our plans (the first time! ), Steve decided he had had it with his stressful job and the travel it took to get there (2.5 hours a day). The money was great, but health and happiness is worth more to us so we worked out he'd be able to take some time to work out what he wanted to do and we could still afford to eat and start our build. We just wouldn't be able to do it all in one hit. He decided carpentry was something he wanted to try - he might as well give it a go while work was being done here anyway, right? We spoke to our carpenter about him labouring full time whenever work started and Darren was more than happy with it. He was excited about being able to teach him and suggested there might even come a time when he could join his team. It turned out his apprentice left soon after and Steve had a job. So while we waited for final approval, then for the engineer, then for the certifier to issue our certificate of construction (this all took months after council's second - and final - approval), Steve earned some money working and learning. By the time it was our turn to start work on our job, he'd had a few months under his belt and was confident on the tools. With his new tradie nickname (Steve-O. Of course!) we were ready to begin. Still to come (er, most likely not their official titles): stair man, waterproofer, tiler, tv and sound guy, rain tank dude... They're the ones I know about! 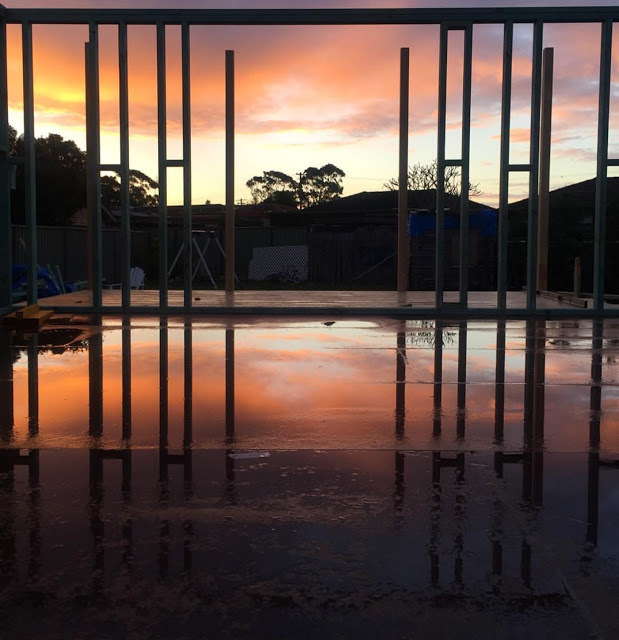 We are also lucky our builder is close with the local hardware and so is able to occasionally negotiate better prices on some materials (also, set up a trade account so you get a tradie discount - every little bit counts!). All this to say, we know exactly what things cost because we get a copy of every receipt so there is no mark-ups on materials which I do know can happen. In the interest of keeping it real, the downside of all this of course is that we often get bumped for another job - generosity of mates rates can stretch so far! So we've been delayed several times as other jobs have spilled overtime or delayed as well due to weather etc. It's not the best way to build, obviously, but we've happily taken this aspect of it on as we know those in-between times mean Steve is earning money too and it's actually nice to have a break from people in and out of your house every day, the constant cleaning, the noise and the fact I have control issues and don't want to go too far in case someone makes a decision on something without me! Ha! Now I realise this isn't possible for everyone, so I've included some tips on finding a good team. We've only ever used two carpenters in our renovations of our homes - one did the last one; this team has done this house. Coincidentally, our current builder actually apprenticed at one stage for our first one! My point is: find a good one and you'll likely develop a pretty close relationship with them. They see you at your worst - first thing in the morning, when your house is a tip, when you're yelling at the kids to get ready for school (and when they backchat you and the fun and games that comes after that happens!). They become part of your life for a while and so you want to find someone you're comfortable with and who gets what you're trying to do and isn't just out to take your money. This has become somewhat of a showhouse for our builder - it's become his pride and joy too as it's a good example of his work to show other potential clients. You want someone who is passionate about what they do and who wants to be proud of the work they do for you so much so they might photograph it for their website or portfolio - or tell potential clients to swing by and check out the deck/extension/cladding job they did at this place... How to find that person? Yes, well... it's not easy! Maybe we completely fluked it? Maybe it's because we still live in that small-town-feel-kinda-place where people are just happy to get their weekly wage to pay their mortgages and drink beer? Whatever the reason, we got lucky twice. So maybe some of these will help you too. Ask for recommendations for a good carpenter/builder - this is how we found ours. Not from Bunnings (Bunnings aren't known to be a trade hardware - they've dedicated themselves to the home DIYer as trades make up such a tiny percentage of their clientele), try the smaller ones or trade chains such as Home Hardware or Mitre 10. These guys know them well - they're in there most days ordering or picking up materials. They chat about the jobs they're working on and they use the hardware as a kind of network to find other subcontractors or labourers if they need an extra pair of hands. The hardware guys aren't stupid - they know the ones who know their stuff, who are down to earth and who are passionate about their work. And they happily pass their details on if you ask them. Same goes for a plumber or electrician - ask at the local plumbing stores (Eagles or Reece Trade) or lighting/electrical stores. I'm not ashamed to say I've door knocked several people and asked them who built/renovated their house! Turns out one builder who did three homes I loved lived in my street (and gave us a quote but the timing was all wrong. And then he moved! ), while another I also really liked was booked out for around two years! But isn't that the best kind of advertising for a builder? Having a highly visible portfolio? And I was able to get first hand info on how happy the client was too. If you love a home nearby, go and knock on the door and chat to the owner. They might not know - maybe they moved in and it was already perfect - but if nothing else, you get to meet someone with taste similar to your own (and maybe even get to have a little snoop inside too!) and will probably make their day with your compliment! I've heard about this for so long and written about it so often but never really knew how it works. Basically, a builder (or pretty much any other trade) pays a large fee each year to be listed. When someone is after a quote for, say, a deck, they will get three quotes. From your end, you get three quotes for the same job. From the other end, if a carpenter agrees to do the quote, they have to pay a fee to HiPages regardless of whether or not they get the job. This means you're only going to get people who are serious about working - because they have to outlay money no matter what. It kind of weeds out the muck-arounds! It also has a good directory on their site for tradies of all sorts in your area. Oldie but a goodie, of course. If you know someone is renovating, ask them all about who they used, if they were happy with their work and if they'd use them again. I told our builder I think he keeps getting Sydney calls for quotes because they're hoping if they bring in an outsider, they might get a cheaper quote. And honestly, I think I'm right. I'm adamant that our extension and renovation would be close to triple the amount if we lived in Sydney. Everything outside of the major cities is more affordable - including tradespeople. They actually show up to your house (seriously). * They listen to what you want and make suggestions of their own that enhance your idea or offer an on-par alternative. * They do some measuring on the spot when you're unsure if something will fit and will try their best to make your ideas and plans work. * They seem genuinely happy to be there and passionate about what they do. * They will rework their quotes or offer alternatives/options to help you keep costs down or meet a budget. * They're happy for you to help in some way. * They push you towards an easier/more common option because it's less work for them.
. It's really not difficult at all - the answers are all there, you just have to read it! ^ FYI: if a tradie doesn't really want the hassle of a job (it's really labour-intensive/filthy/fiddly and time-consuming/lots of roof work in the height of summer or a potential landmine of extra nightmares such as an old house that has lots of secrets inside its walls you won't know about until you start pulling them down), then they tend to increase their quote by a fair bit. This is a hint they don't want the work, but it also means that if you agree to it, they are compensated for the crappiness that will come with them accepting. And I've been on the other side of this - Steve comes home completely exhausted and filthy some days. He's been covered in old insulation, stuck in confined spaces or has been jackhammering concrete floors ALL DAY. Compare that to the joys of building a deck or pergola on a nice spring day! I don't know many people who'd choose the former over the latter! Well, I hope that helps a little. It's hard finding someone good and it's even harder getting their timings to line up perfectly with yours. But you'll find them - I'm sure of it! So. When we were house hunting four years ago we had a few musts: it needed to be a fixer-upper because we wanted to make our own stamp on it. Location was important - we wanted to be close to the water. It had to have good light, good structural bones, a decent yard and the potential for us to add to it. We found the ugliest house in the best street with water views and snapped it up. The good thing about it being an ugly house was there was no history or architectural details which we had to work around which is often the case with old houses. This was fibro. It had plain walls, plain windows, plain cornices, plain everything. It was essentially a blank canvas (and I hate using that term, but it's true). Our last home had pretty cornices, timber windows and a real cottage-y feel to it we tried to keep while modernising it. Our first house was a historical semi we didn't dare touch aside from paint in tones true to its style. This house had nothing really. It gave us freedom to do what we wanted without feeling guilty about veering away from its "style" or stripping it of character. I believe in working with what you have and if it had any redeeming features, we'd definitely have worked with them in the design process. As it happened, we ended up creating the story of our house once work started - we recycled parts of the old roof into stair treads, changed the floor direction in the extension and kept a few original parts like the old knocker and house numbers. We have piles of hardwood from the roof that will become a bar top and library shelves. We reused the huge beams as heads above doorways and windows, moved some windows around and recycled doors. It's nice to have a kind-of-cool answer for the "why is that like that..." questions that might come. But before we even got to creating a story, we had to create a plan. And while it's tempting to look at magazines and Pinterest and blogs and imagine yourself in that space, there are so many more factors to consider aside from loving something because it looks pretty. Captain Obvious, right? Well yes and no because despite all my constant writing about this stuff, it's easy to get swept away imagining something when the reality is likely to be very different. And know that it's not just a matter of things being different due to your tastes or location, but it's to the rules of YOUR property - and they might be different to your immediate neighbour's. It's the way you live your life. It's your actual home's ability to handle the changes you wish to make. It's your budget. And weather patterns. It's your personal needs and those of every person who lives there. The list of things that can affect your home's design is endless, so by all means look to others for inspiration, but be sure to design the best space for you and your family, taking into consideration all the musts/have-tos and can'ts along the way. After a few harsh realities from Steve (who rolled his eyes every time I showed him an all-white Swedish space and explained "something like this! "), I wondered how close to the mark we would get in terms of creating a home perfect for us. While we've not finished or been able to use our space completely, so far, I can't see much I'd change if I had free reign. Which makes me think the long, long design path was the right road to take. If you're looking at taking yourself on a similar renovation journey, here are a few things we learnt along the way. Any magazine article on renovating will tell you to live in your space before you do anything major to it. There is a good reason for this - because it helps you make better decisions. If you can do a full year, do it - because honestly, your home is so different throughout the seasons and you want to ensure you know it back to front. The light falls differently in winter to summer - we discovered the afternoon sun bounces off the verandah of the house across the street from us and rebounds into our bedroom in summer and lights up the south side of the home in winter. We know the afternoon sun is unbearable in summer at the back of our house (which faces West) but that the sea breeze cools things down most days too. We know how the yard floods and where the shade falls for prime planting. We've worked out where we have mould problems, where we like to dump our wallets and keys, how we don't walk down the driveway but across the middle of the lawn to the front door, which way the weather usually comes from and where the rain affects us most. Putting up with all the annoyances that come with an unrenovated house is worthwhile because you work out what annoys you, what you like, how you live, what you need to make living better - knowing all these things is essential for good design. For us, we needed more space - we had a tiny three-bedroom, one-bathroom home. It had a living room, kitchen/dining and that was it. All up, it was 80sqm. We weren't after a huge house, but with four kids, we definitely needed more space! We renovated the bathroom and kitchen spaces with an extension in mind - we decided we could just extend from the back out so worked out a way to do just that so whenever the time came, the existing house shouldn't require much work. And then we planned and planned. We worked out what we wanted exactly: some kind of loft space, raked ceilings, two living spaces and a fireplace. We wanted at least four bedrooms, but five would be better so everyone could have their own room if they wished (I am now DYING for them to all be in their own rooms because I'm over the bed-swapping, whinging, kicking and meltdowns over who gets to stay up later and who doesn't...). I wanted lots of storage because the house had none. So we incorporated a dedicated storeroom into the plans. It turned out that Steve changed careers while waiting for council approval and so the storeroom has been renamed his workshop for all his tools. It will be the world's tiniest workshop but still! Luckily I still had large storage areas planned for the roof - having a high-pitched roof means the unusable areas can be walled off and used to store alllll sorts of things! The thing with major renovations is this: there are SO MANY DIFFERENT ANNOYING RULES AND ASPECTS TO THE PROCESS. And you don't really know about any of them until you're at that stage. First up for us was the biggest bummer of all: we had to do a full development application for council. Many renovations and extensions won't require this - you can go through a private certifier and they can have your plans approved within a few weeks. But if you live in a flood or bushfire zone, you most likely won't be that lucky. We live in a flood zone and so straight up we had bonus conditions - the biggest being we had to raise the floor height by 60cm. This meant the nice walk-straight-out-of-your-living-room-onto-your-deck-onto-the-grass moments and easy view of the kids playing in the yard from anywhere in one side of your home wasn't going to happen. It would be about a metre or so off the actual ground. Having to step up the extension means a split level to the ground floor, which means extra materials in height (more bricks for footings/longer pieces of wood) extra precautions in stabilising the building and a more difficult build as it's higher off the ground (we had to lay a subfloor so the builders didn't just rely on standing on bearers and joists - this was an extra couple of thousand dollars immediately). The huge pitched ceiling I wanted with a bedroom in it? Couldn't quite do as I wanted - did you know habitable rooms (living/bedroom) require your ceiling height to be at a certain height (for memory it is 1.8m but I could be wrong there) for 2/3 of the volume of the room? We wanted the angled ceiling to just hit the floor, so in the end, knee walls had to be built to decrease the size of the room so our master bedroom won't quite be as we imagined it at first, but the library can be. There are also height restrictions (we just snuck in for how high our house can be), light-to-dark ratios through use of windows and doors, shading requirements (we need little awnings on our east-facing bedroom to shade them) and so. many. other. annoying. things. The draftsman/architect/builder who designs knows these tricky little things and will outline your options. In the end, our draftsman discovered if we submitted the second story as an "attic bedroom" rather than a second storey, we had a little more freedom with our plans. One thing I suggest is to give your draftsman/builder/architect a ball park figure of what you want to spend - underestimate it, though. Because if you give them no budget to work to, they will design just design to all your whims and you might end up with a house you actually can't afford to build! And never feel you have to do EVERYTHING all at once. It is a good idea to design your home and submit everything in one application with a view to doing it in stages as budget/time/circumstances allow. We never planned to complete our extension in one hit. We wanted to do it in two to three stages with our master bedroom and ensuite being the last thing. If you have plans to put in a pool or garage or separate studio down the track, consider doing it all as one DA and get the approval now. It will save you in extra drafting and application fees later on. Depending on the scale of your works you might not need a draftsman or architect. Many builders are able to draw up and submit plans on your behalf and if it's less complicated works to a place that doesn't change the footprint of your home, a carpenter might be all you need. We knew we needed plans drawn up but as we had a good idea of what we wanted, we knew a draftsman was all we needed. If you're stuck for ideas about what you want, I'd still start with a builder who can at least point you in the right direction of an architect if they believe one is required. Every time I got a draft plan from the draftsman I printed it out and got out my trusty red pen for changes - because there were always changes. I lived and breathed these plans - even dreamt about them sometimes! But that is the good thing about drafting plans - they are drafts and can be changed. And you should change them at the planning stage because it will cost you a lot more time, effort, money, patience and possibly relationships if you change them once the build begins! For me, I'd use the printouts to just see what it might look like if I moved the wall a little more this way. Or if I moved the door layout or added an extra room. Always sit on the current draft for a while and get a feel for what it might be like. Measure things out - I would use string and mark up the walls/doors/windows on the grass so I could physically see the floorplan in the right scale. Get a feel for the space in terms of size and look for things like views from windows and doors, door swings and potential furniture placement. There is often a little wiggle room for small changes once construction begins such as window size and placement, but nothing too drastic, so get it right now. We took our time with our plans - probably waaaay too long but there were a fair few delays on both sides of the process and in the end, we're glad there was a wait because we love our plans. We were also lucky in that our draftsman had a fixed price so it didn't matter how many changes we made, our $3000-odd fee for the measuring/drafting/submitting didn't budge. Spoiler alert: the engineering fees were a surprise $5000 we weren't expecting! There are going to be restrictions but it's what you do with them... We had to raise our floor level which brought a few headaches for the builders and extra costs for us, but we started to see the advantages of having this split level. For one, it broke up the extra-long space and created two distinct living areas. 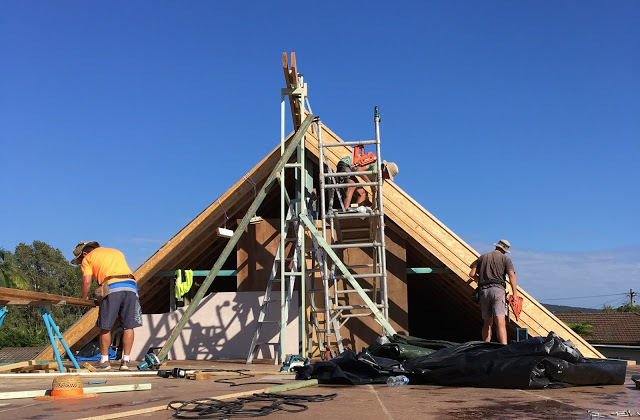 It allows us to see the water views from the back room and has created a large under-house space where we will able to store our water tanks, excess building materials, kids bikes and surfboards etc. The fact we have to apply builder's bracing (which is essentially thin plywood sheets made from hardwood at $35 a sheet) to all of our existing interior walls killed me (and here I was thinking we wouldn't have to touch the existing house too much!) but it meant we were able to insulate them as well, meaning the bedrooms on either side of the bathroom are now a little more soundproof. It also got rid of the wallpaper that had been painted over and often bubbled up during wet periods and means our Gyprock walls will be nice and straight and new. The engineer's obsession with bracing, particularly expensive materials and extra strengthening requirements means our house is the strongest, well-built thing in town. It's not going anywhere! Sometimes I would look at our plans and wish for larger expanses of glass by way of bifold doors from the family room onto the back deck. And then I remembered the heat in the middle of summer. And the bugs. And the sand and crap that would fall in the rails of the bifolds. And that I love French doors more... We went against the norm because it doesn't work for us. Realistically we knew we needed a decent size door opening but also windows on either side of them that could be open all night long if we wanted for safe, mozzie-free breezes and airflow. We knew as much as a big deck sounds great in theory, it would encroach too much into the backyard, which was more important. And we're not big entertainers anyway. We know pretty pendant lights are going to have to take a backseat to ceiling fans. And timber windows or louvres everywhere were just going to eat too much into the budget. Getting the right mix of practicality and aesthetics is hard and if you really want to live in a place, aesthetics will most of the time lose out to practicalities in a battle of the wits. Like my whitewashed floors. I love them to bits but we're going with a mid-range natural colour for floorboards because we're a rough and tumble family and that's the best colour to mask wear and tear and the inevitable dirt that comes with living with children. (Though Steve is still A-OK with my painting our eventual master bedroom floor pure white. It will have to be a no-shoe zone!) Think honestly about how you live, what your budget is and what is important to you and plan your home around them. to never sign up and start building if all you have is the dollars the builder quoted you. Because it will ALWAYS cost you more, somewhere along the line. And it's usually before the builder even begins! or at your newsagent if they still have them in stock. Otherwise I did find a lot of what I wrote has been uploaded to the Homes to Love website. It's not everything, but it's a fair bit. I've linked to a few of the sections below. Two years in August, we contacted a local draftsman to talk about drawing up plans for our house extension. TWO YEARS AGO. Ever heard this old gem - that renovations always take twice as long and cost twice as much as you planned for? Yeah, so far, the first part is true. We're yet to find out about the other part because, well, we’re only a few weeks in and while the bills have been frequent and hefty, we really won’t know final costs for a while! We were originally told if all went smoothly we could have our plans drawn up, submitted and approved through council in a maximum of 12 weeks. Hahahahahahahaha. No. Not even close. It took us a year to do plans, soooo many months in council, stuff-ups and surprises and life stuff too. And so two years after showing our little sketches to the draftsman, here we are, seeing them come to life. It’s SO exciting - we might even be able to host Christmas here this year (I’ve had to swap with my sisters for the past three years!) But I shouldn’t get ahead of myself - read those first few sentences again! asked me to write an entire magazine on renovating. I'd been planning to contact them about writing again - it'd been a while since I’d done any kind of work and I was feeling like the time was right. In the end, they got me first and I agreed, although about two weeks in I started to regret it as it was a HUGE job - and not exactly easing back into work, which I'd envisioned I'd be doing! But once I got past the "OMG where do I start?!" I started to enjoy it. I've always been annoyed by magazine articles on renovation or those bathroom and kitchen guides - I never feel as though they cover the right things. It's all so general or about aesthetics - or with huge budgets And don’t even get my started on renovation shows… I can’t watch them. And I LIVE for this stuff. I’ll only watch the UK version of Grand Designs - that’s it! Anyway, for the reno guide, I was pretty much given free reign to write about what I wanted to write about as long as it fitted within their general section guides. And so I did. I wrote 40,000 words on renovating - why you should, where to start, who to contact, what things might cost, how long things might take, things you should or shouldn't do, how to shop, how to deal with tradies, how to decorate, how to be environmentally savvy, all things about windows, doors, floors, paint, hardware, lights, all the rooms, outside/inside and behind the scenes. I tried to include meaty information like measurements for placement of bathroom and kitchen fittings, who to contact for what job (you don't always need a builder or architect), what you'll be out of pocket before you even lift a hammer, and even if going the home builder route is for you. Basically, it was a 101 in renovating. It was something I always wanted to write and something I always wanted to read. is out now in newsagents and I do hope it's helpful! And yet despite a whole magazine dedicated to it, I couldn’t cover everything - and I couldn’t get specific on something that is going to be entirely different one build to the next. And so, as a kind of extension (ha! see what I did there?) on that magazine, I thought I'd outline our own project here - what we've gone through, how long things took, what they cost, our problems and solutions, the good, the bad, the ugly! We are going the owner/builder route ourselves and one step further than that: Steve is literally building it! After being over his career for a while (politics/media!!!!! Not surprising! ), he resigned late last year to start a whole new career: carpentery! We've often longed for a more relaxed, simple lifestyle - less stress, timeless skills, more time together... We came to that great understanding that earning a lot of money didn’t mean happiness, so we changed our stars. We spoke to the carpenter we planned to use for our build and he was so keen for Steve to work on our house - he was happy to show him the ropes and build up his skills with a view to being accredited down the track via prior learning. In the end, his apprentice left and he offered Steve some work before our place was ready to go, so Steve donned the tools earlier this year and has been his trusty sidekick ever since, starting from scratch in a new career. I'm so proud - and so excited he will have such a huge part in building our extension. Another thing we’ll be doing - and documenting - is paying for everything ourselves. It’s kind of bugged me for a long time now that somewhere along the line, blogs equal freebies - especially in the DIY/home arena. I often can’t look past the fact that someone got something for free and that’s why it is in their house. I can appreciate people earning money from their blog or turning it into their career and I really enjoy a lot of the blogs that do accept freebies - some of my faves manage to work it well. But that side of things is not for me. I’d love to some day, somehow, monetise my blog, but the current model with sponsorships/gifts/freebies etc isn’t for me anymore. and while it’s tempting sometimes to say yes to things that are offered - especially if it really is something I’d probably buy - I don’t feel it’s a true reflection of what renovating/decorating/home-making is about. And I’m all for sharing the real side of things. So if it comes down to real budgets, real compromises are going to be made. And by real I don't mean hundreds of thousands of dollars and top-end everything. Ours is ballparked at $170k but that is for a huge extension, second storey, laundry, two decks and balcony. I know in parts of Sydney that money might buy you a couple of decks and a bathroom renovation. I also know in other parts of Australia it could buy you a beautiful house. I'm not saying it's a budget renovation, I'm just saying our money is going to have to work really hard to get what we want. We aren't taking out a loan or extending our mortgage, it's our hard-earned money going back into our home with hard physical work (well, Steve's hard physical work!! ), careful choices and lots of compromises. And because of that - our home is not going to be Pinterest perfect. And it’s not going to be designery, too tricky or trendy. It’ll just be a home that reflects our wants and needs - and that is what everyone’s home should be: a reflection of the people who live there. Not those who live in photoshopped pages of magazines! Because no-one lives in those rooms as they're portrayed. I KNOW what goes on before a house makes it into a magazine - lots of props (I recall a house having its entire contents replaced for a photoshoot!) rearranging, seeking of good angles, professional photographers and stylists, editing, cropping, photoshopping… Don’t ever feel bad you don’t measure up. All that applies to Instagram images of people’s homes and lives too, by the way! Consider them inspiration and use them to inspire your own spin on it. It's taken me a while, but that's what I do now. I figure by sharing our journey, you might pick up something (or pick up what NOT to do on some occasions! That’s good too!) to help you on your own renovation journey. If you have something you’re particularly keen on knowing about, please let me know. I’ll try to work it in somewhere! Next up: working out the design…. One day I'll get around to doing a kitchen one too. One day!